Israeli company’s main aim is to appeal to busy families where the parents work long hours, travel a lot and love technology. In the fourth season of the American TV sitcom “The Big Bang Theory,” theoretical physicist and all-around nerd Sheldon decides that he no longer wants to physically interact with his friends and colleagues. He cobbles together a telepresence robot with his face on its screen, which navigates around his home and office and turns to face whomever Sheldon is speaking to. This fictionalized glimpse of a future filled with personal robots is simultaneously hilarious and creepy. 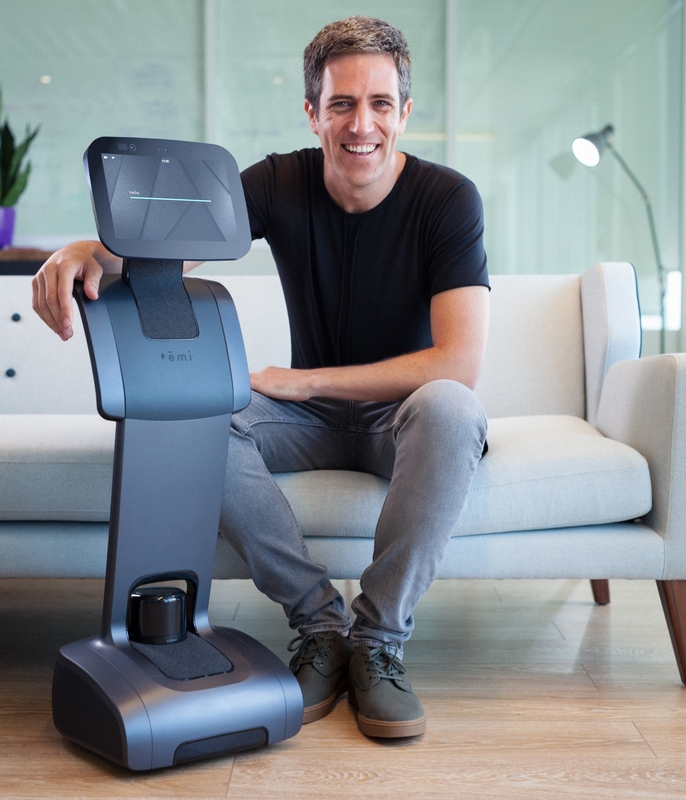 “We took the creepy factor into account when we designed our robot,” says Danny Isserles, CEO of the US division of Temi, an Israeli robotics firm that is building an almost functionally identical (but a whole lot spiffier) version of Sheldon’s telepresence unit. 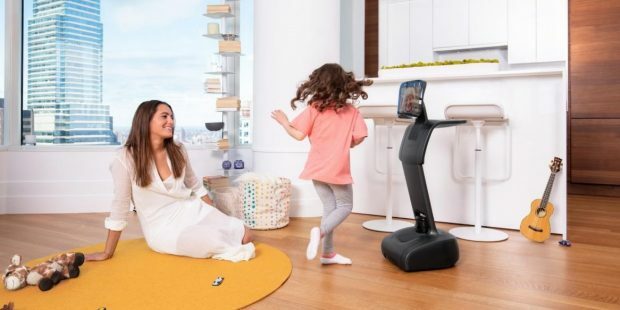 Temi has a sleek, semi-rounded body – it looks a bit like a high-tech vacuum cleaner with a subtle human presence – and stands 3 feet tall on its four wheels. Inside Temi are two main computers. The first comprises Temi’s “face” made from a customized version of an Android tablet. “It’s nothing special,” Isserles concedes in an anything but robotic conversation with ISRAEL21c. As with most Android-based mobile devices today, the Temi tablet can display video, play music or call up the Internet by voice command. “We’ve done a demo of Temi controlling a smart home. 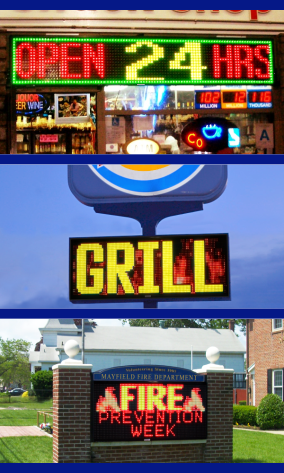 It can turn the lights on and off,” Isserles says. Any Android developer could add other apps, for example to make Temi control a smart home thermostat. Temi’s “body” has a full Linux-based computer inside plus an array of sensors – LiDAR, 2D and 3D cameras, encoders measuring the wheel’s movements – that help Temi navigate smoothly. “In order to get from one side of the room to the other, we humans instinctively choose the easiest path to follow with no effort, passing over small obstacles and around bigger ones,” explain cofounder and Temi Israel CEO Yossi Wolf. But this is a complex task for robots and the shortest way is not necessarily the fastest. That may not last for long. Amazon reportedly is developing a robot known as “Vesta” that follows users around like a mobile Alexa. Other home robots in the works include LG’s Hub bot, Mayfield Robotics’ Kuri, and Jibo out of technology powerhouse MIT. Temi formally launched sales at CES 2019 in January and expects first deliveries to be made in March. 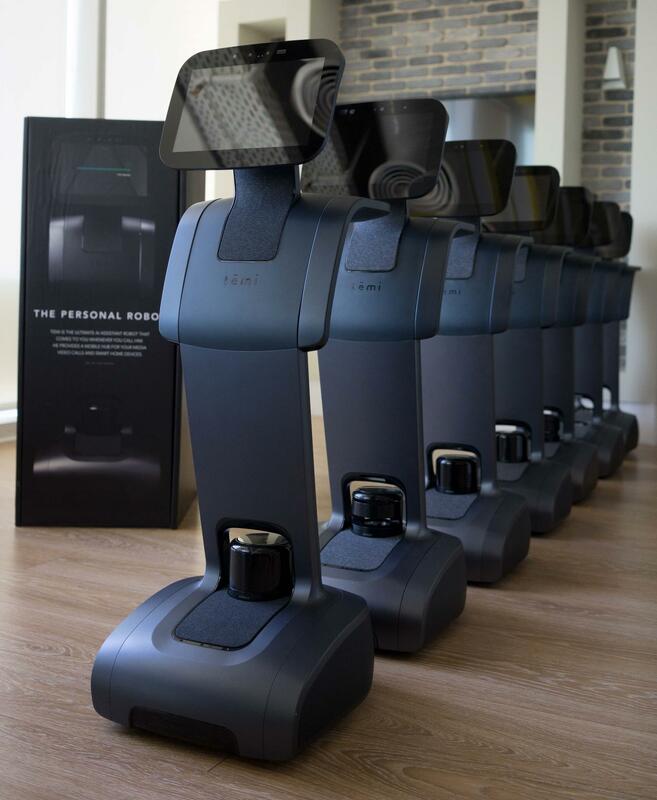 The robot can be ordered now on Temi’s website and through select retail outlets in the US. A half dozen immediate applications for Temi come to mind. In the office, a staffer on the controlling side of the robot can make like Sheldon and attend a business meeting without actually being there. 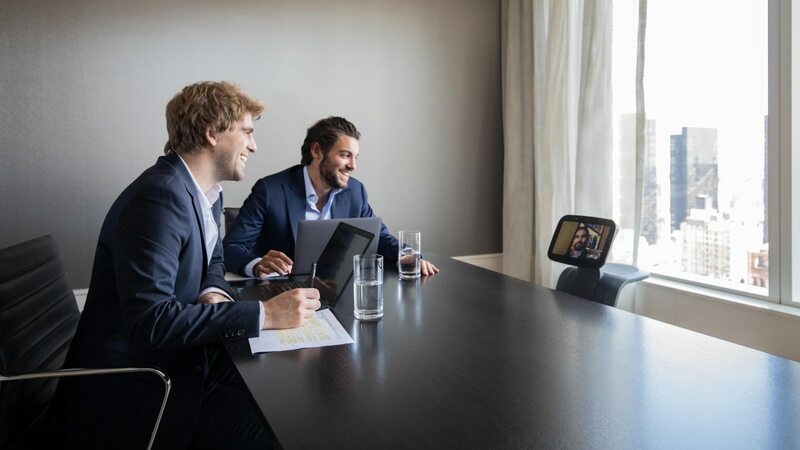 A manager can stroll around chatting with colleagues and, unlike video conferencing, there’s no need to interrupt anyone’s workday to assemble in a meeting room. Temi can serve as the host at a restaurant (“Hello, I’m Temi. Welcome to Applebees”), a hotel concierge, a sales clerk, an airport check-in agent, a museum docent, a remote yoga teacher, a playmate for the kids (imagine “hide and seek” with a robot), an aid for home-bound seniors and a remote-care physician. But the main idea is to provide a telepresence in the home. But why do you need a robot for that? Couldn’t you just Skype from the computer or an iPad? You can also ask Temi to initiate the video by tapping Temi on its head or saying “Hey Temi, call Mom.” Temi will lock on your position, plan an efficient path to get to you wherever you are in the house, initiate the call and then follow you around while you talk. Isserles says that Temi’s marketing aim is to appeal to busy families where the parents work long hours, travel a lot and love technology. It still sounds a bit creepy – would you want your robot father sitting at the dinner table with you, turning its Android head from side to side to keep the conversation flowing? “My experience is that everyone who came in thinking it’s creepy, after a minute or two of demonstrating how it works, they ask, ‘How much is it?’” Isserles says. The price is cheap by robot standards – just $1,500. That’s partly because Temi was not built, like most other robots, for defense purposes, where a single robot could run up to $200,000. That said, Temi actually got its start from the defense industry. CEO Wolf previously cofounded Roboteam to build tactical robotic systems for reconnaissance, intelligence gathering, search-and-rescue and delivering payloads to soldiers in the field. Temi was originally part of Roboteam, but the companies decided to split with Wolf going full-time with Temi while his cofounder Elad Levy remains at the helm of Roboteam. Temi employs 65 people, most in the Tel Aviv R&D center plus 10 people in New York and 20 in China, where the robots are manufactured. The company has raised $82 million, including $21 million in December 2018 from former Alibaba CTO John Wu, Italy’s Generali Investments and Hong Kong-based Internet of Things company Ogawa. Temi and Ogawa have established a strategic partnership with an emphasis on selling in China. 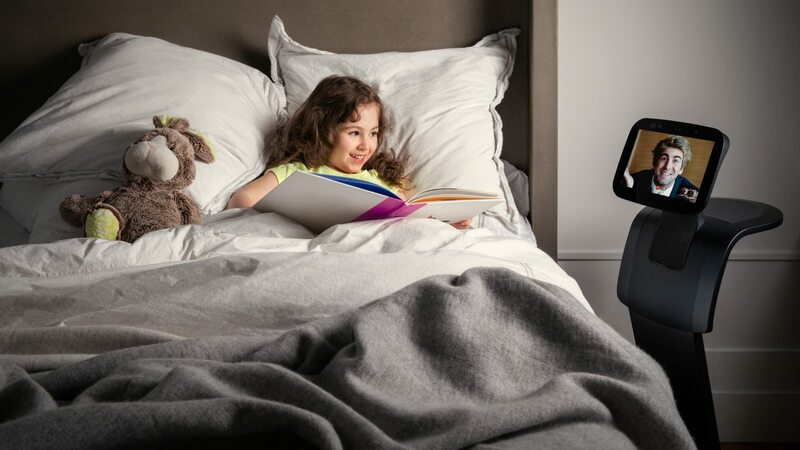 While Temi is being initially positioned as a roaming telepresence device, the robot can work without someone on the other side. Ask it to play a song and Temi will call it up using its built-in Wi-Fi connection, then blast out the tunes via 20-watt Harman Kardon speakers. Temi’s 10-inch touchscreen is great for playing YouTube videos, too. Temi gets eight hours of continuous use per charge and has a docking station for repowering. Temi has one more unique selling point: a tray. Tell Temi to fetch some tea from the kitchen and the robot will return with the chai, although a human has to load and unload the teacups. The tea tray turns out to have been the genesis for what would evolve into Temi. Wolf was visiting his grandmother and she offered him some tea. Every Jewish startup “starts from the grandmother,” Isserles quips. Even those building personal robots.